– The issue of race has not been settled in the US, despite the passing of 150 years since the abolition of slavery. Black people in the US are still living under the threat of racial violence. They are killed in disproportionate numbers by white policemen, and many towns and provinces in the US are divided by race. In 2015, nine black churchgoers in Charleston, South Carolina, were massacred by white supremacist Dylann Roof More. This incident led to the removal of more than 60 Confederate monuments or symbols that are considered to be a glorification of slavery and the oppression of blacks. However, the feelings of white supremacy remain amongst many, and the removal of their symbols has enraged them leading to this latest demonstration and violent attack. – The double standards towards black and white in the US are matched by those towards Islamist and white supremacist violence. 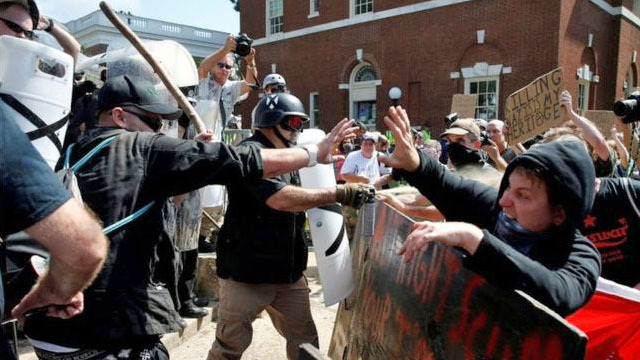 US President Trump refused to condemn the white supremacist groups behind the violence, and he received criticism for that. However, Thomas P. Bossert, the White House Homeland Security adviser, tried to defend the president saying he had not wanted to “dignify the names of these groups of people.” It is strange that Trump did not want to name those far-right groups who commit violence and murder in the name of hate when he was elected on a campaign pledge to name Islam as the cause of terror in the world despite the fact that white supremacist attacks result in 3 times as many deaths in the US as those caused by terrorism committed by Muslims. The far-right are Trump’s power-base and he will not offend them by calling them by name or accusing them of a centuries long campaign of terror against black Americans. – Fear is widespread in the US, and 150 years after slavery, the first black deputy mayor of Charlottesville, Wes Bellamy, is trying to remove the statue that many black people see as a symbol of hate and oppression. Mr Bellamy said, “I get hate mail and death threats every day. I’ve been told I will be hung from this statue. I’ve been told I will be hung from the trees in this park,” in response to his efforts.